I wish someone would tell us about an adult baseball league around here (neighborhood blog league anyone? ), but if you're looking to get your little slugger in the batter's box, checkout the SFX Huskies. Kensington resident and SFX Youth Sports board member, Steve Reiser, is pleased to announce that the SFX Huskies will begin trying out new players aged 7-15 for its travel baseball program beginning next Saturday, January 10 at the SFX gym located at 752 President St, off of 6AV. Click here for info or email me directly at steven.reiser@verizon.net for more details. SFX Youth Sports also has an instructional program for all players that do not make one of the Huskies teams. No child is turned away! Getting your own kid involved in a competitive baseball team now is probably our only chance at grooming some players for a successful Mets pennant bid in 10 years. So please, for the good of the city, consider this. So we've been getting a lot of your emails asking us to help peddle your used lawn chairs. On the internet, there's no shortage of people looking to take stuff off your hands, but let's face it, no one wants to shlep out to Greenpoint to trade commemorative plates for a sockful of nickels. Enter KensList. Keep your eye on the new box on the right for local classifieds. Want something posted to KensList? Drop an email to the address below and let us know. Your ad will see facetime from real locals, just like you. You should use this feature to buy, sell, or trade goods or services, to meet people for specific purposes, or really, for anything you'd use any other classifieds service for. Except this one is all Kensington, all the time. Click through if you see anything you like, and drop us a line if you have anything you think people would like to see. UPDATE 2: The address above is now correct, thanks Greg. After a bit of a holiday break, we're back on task and ready to wrap up Round 4. Operators of Yen Yen Chinese Restaurant: on behalf of the food-eating people of the village of Kensington, we order you to accept this worthless bauble graciously, and furthermore to display it prominently for all to see. Failure to comply will result in a shunning the likes of which has not been seen since the original Persian Restaurant Wars of the early 7th-century. Congratulations are in order. Next up: Continental Indian. Nominate in the comments. Restaurant wars continues. There can be only one. Ask Kensington: Can you recommend a good real estate broker? It's that time again. A new Kensingtonian is about to join our ranks... but he needs your help. I'm looking to move to Kensington next month... I'm wondering if you can recommend one or more good brokers for apartments in the area. So we're putting this one up knowing full well that we're opening the comments up for lots of shameless self-promotion and possibly some pretty scathing complaints. Please, behave yourselves. Oh day of days! Festivus is here! Please join us at Visions Bar and Restaurant at 8pm tonight and meet everyone! We are expecting a great turnout and are looking forward to meeting some folks in the neighborhood. We hope you are too. Be prepared to air your grievances about your family, friends, neighbors, and Kensington at large. Ask Kensington: Which drycleaner won't ruin my clothes? It's time for another installment of our award winning* Ask Kensington series! So after having yet another dress poorly pressed (you could see the marks) and a hem ripped open at our 3rd attempt at a drycleaner... I'm wondering if you could post a recommendation forum of some kind so the good citizens of kenisngton can recommend a good spot? Anyone have a particular drycleaner with which they've had continued success? Let Liam known in the comments! So word on the street is we have an opossum population right here in Kensington. Local Brendan tipped us off to these cute little marsupials after snapping a shot of this critter on Albemarle Road. Though this photo looks a little gruesome, in all likelihood this thespian of the animal kingdom is very much alive and out rummaging through your garbage or chasing tasty rats into the safety of your home right now. I, for one, welcome our pointy-snouted overlords. NYC ICY is offering soups for the winter because NOBODY is going in there. Let's not let another great local business fail. They offer gourmet ices and sherbets. They have sophisticated flavors like Grapefruit basil ice, Apricot Ginger etc but also stuff kids like such as Fire Engine Red Ice. The Sherbets are really good too but no Ice Cream per se. They sell it by the pint which is great to bring to a dinner party and the flavors change all the time. The owners live in the neighborhood. Business has been SO SLOW that they are thinking of closing for at least the season. I heard they are offering soups. It would be great to get people to start going there before we lose yet another business over here. I personally stand guilty of not patronizing this local business, but it was only due to ignorance. I only saw it for the first time three days ago and got this email yesterday. It sounds delicious, different, and the sort of thing we should support. Yelpers seem to agree that it's a fine establishment. So go buy some water ice! Or some soup! It is your civic duty to bolster the local economy in this time of recession. NYC Icy can be found near the corner of Church Avenue and Coney Island Avenue. Well, graffiti 'artists' like it. But their opinions don't count much. Train robbers like robbing trains too. Back to graffiti, we have to ask ourselves why we hate it so much. It's annoying, illegal, and can make otherwise nice places look like dumps. When we see it, we rage inside. Why, we wonder, would anyone waste their time with such a thing? Who, we ponder, might this Vegeta person be? And what, we muse silently, can we do to stop him? You can hope to stop defacers in the act by attempting to be in the right place at the right time, but unless you're armed with something stronger than harsh language, you may find yourself alone and freshly mocked. There's nothing less threatening to the average criminal than the phrase "Hey, you! Cut that out!" Alternately, you can fill out a Graffiti Report form that the city of New York has so kindly made available to us. I have no personal experience with the effectiveness of said report, but in the best case scenario, someone comes along a couple weeks later and makes a new blank sheet of paper for someone to tag. Or you could accept the fact that, like jaywalking and music piracy, graffiti is here to stay. There's an upside to this. Qualified acceptance allows us a measure of control. Why should we be content that the surfaces throughout Kensington be covered in meaningless scrawls? If we must have it, then we should demand the best. 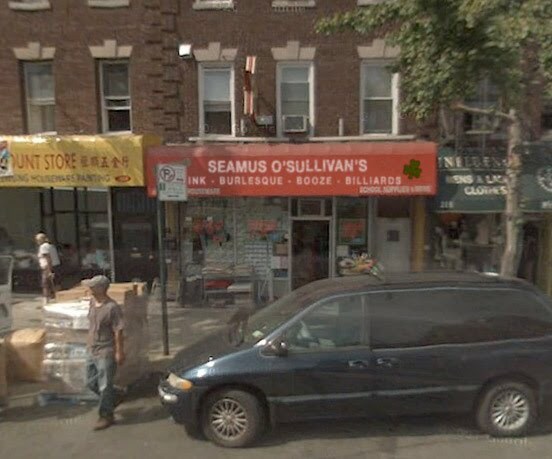 Let the journeyman can-wielder drift down to Midwood to ply his lesser craft. In Kensington, we should settle for nothing less than art. This can be accomplished by fillling out this Graffiti Report Card and taping it up next to local defacements. If we can't stop them, we can at least shame the bad ones into leaving the best urban easels open for their betters. You may have noticed something shiny and new in the heart of Kensington. 46 days ago, a man named Ali trundled his stainless steel cart to the northwest corner of Church and McDonald and set up shop. Smiling widely while grilling his chicken, he opines that his native Afghanistan offers the best food in all of Asia, because they keep their recipes simple and cook more of the animal at once. 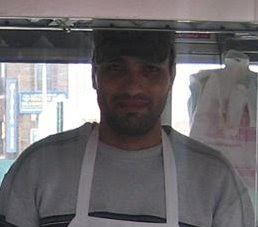 Ali has spent much of his 2 years in the United States working at Middle Eastern restaurants (including Gyro King), but recently decided that going into business for himself was wiser. We have to agree. The lamb and chicken were both succulent and flavorful, the pita was fresh and grilled ever-so-lightly to add that crucial razor-thin layer of crispness, and the white/hot sauce combination was perfect. At $3.50 for an overloaded gyro or $5 for platter with rice and a drink, the one-two punch of taste and value is pretty extraordinary. So the next time you're emerging from the subway at Church & McDonald, wondering, as we all do, what you're going to do for dinner that night, swing by and see Ali. You may find yourself coming back for more than just the food. If you're in Park Slope today buying christmas ornaments made out of recycled hybrid mopeds, stop by the Kensington Kitties wagon and meet some of the cats and kittens they have available for adoption. They need good homes, but a dollar or your pocketful of change always helps too. Click here for more information. For anyone who is a member of the Kensington Facebook group and received multiple annoying invites to this event, we apologize on behalf of the sad, lonely Facebook software engineer who was playing Minesweeper instead of doing proper quality assurance. This event is still happening, and there seems to be quite a bit of interest, but the RSVP list keeps resetting and then it re-invites everyone to, I am sure, their extreme annoyance. So, we removed the event from Facebook and are re-adding it. We hope that A) this will be the last invite you receive and B) you still plan to come out and meet everyone! Update: Deleting and re-adding the event seems to have worked out the kinks. See you at Festivus! The Sean Casey Animal Rescue invites you to join them and the Open Mic Project for a night of live music, raffles and contests at our holiday party. Come celebrate a successful year of rehabilitation and adoption of a record number of orphaned animals. 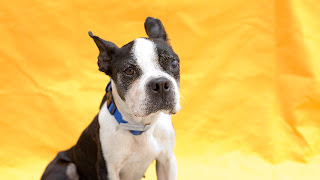 We rescued over 2,000 animals in 2008 and we are aiming high for 2009. But we need your help and support to continue our work. 100% of the $20 cover charge will go directly to the rescue. Join the Sean Casey Animal Rescue for this event at 9pm on Friday December 12th, 2008 at The Old Carriage Inn - 312 7th Ave (between 7th & 8th St.) in Park Slope. This is a little old, but it's news to me. Apparently they've been testing these on occasion for a little while now. They have the automated announcements and light-up maps and the whole shebang. Anyone else seen these or have any more info? We've been getting some questions in our inbox over the past week or so that we probably aren't the most qualified to answer. We're hoping you can provide some insight to others in the community. So here's looking at you in our first installment of Ask Kensington. I am really struggling with a decision about where to move and am looking for advice on whether living on Ocean Parkway and 18th ave is ok. I live in Bushwick now so don’t expect perfect safety. 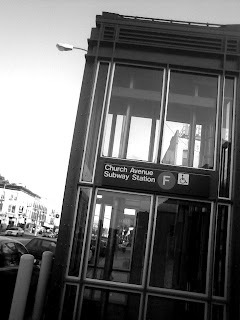 I’m just wondering what the F train at 18th ave is like during normal times of day on into the evening around 11pm. Sound off in the comments section and help a fellow Brooklynite out. Update: April has decided to move to the area. "Thanks for responding! It is so hard moving into a brand new neighborhood, but I like what I see so far." People of Kensington, clear your schedules for Thursday, December 18th, 2008. 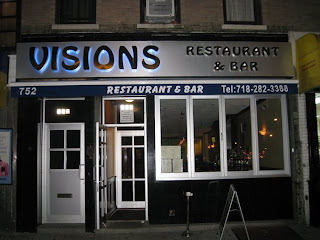 From 8pm to 12 Midnight, please join Frank, Estelle, Steve, and Jake for A Festivus for Kensington at Visions Restaurant and Bar on the corner of Cortelyou and Coney Island Ave. This will be a no cover charge holiday event for locals and anyone else who wants to come. Let's wrap up 2008 with a bang. Happy Thanksgiving, Kensingtonians. Watch out for that tryptophan. THE AUTUMN CHILL AT GREENWOOD PLAYGROUND! - Thai Tony's and more! DON'T FORGET....FRIENDS OF GREENWOOD PLAYGROUND NEEDS YOU TO MAKE IT ALL POSSIBLE! 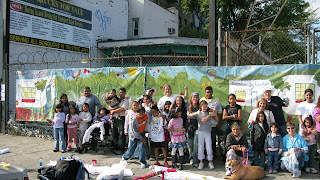 The West Kensington Action Group's mural painting event was a great success Saturday afternoon. Dozens of people dropped by the empty lot at 31-35 Church Avenue to lend a hand and paint a flower or two. The day provided a wonderful opportunity to meet other people in the neighborhood also concerned about the future of Church Avenue. The group hopes that the event sends the message to local politicians that west Kensington must no longer be ignored. Paints by George provided paint and brushes, canvas was paid for by Shannon's Nursery, Foodtown brought over snacks and drinks, and Dahill Halal Pizza fed the starving artists free pizza. Free children's books, voter registration cards, and a petition to usher in more green jobs with the next administration (greenjobs.org) were also provided. Though the owner of the lot and city officials have been contacted for years about the rat and garbage issue, the problem still persists. The community feels that the entire west end of Church Avenue is anchored by the deterioration of this huge space that has sat empty for many years. As one neighbor put it, "Its' a real shame. The only green space over here is locked up behind that gate and littered with garbage!". "Dear Neighbors, this mural represents a dream of what our neighborhood could be if we came together as a community and turned this lot into a green vibrant part of a thriving Kensington. 31-35 Church Avenue has been neglected by its owners for years. We have tried to enlist the help of our city officials to no avail. The time has come to take back our neighborhood but we need your help!" How are people liking the new hours and new menus? When we walked by on Saturday or Sunday mornings the place has been crowded. Opinions? Mural Painting TOMORROW at 11 am. We would really appreciate your support today 11-3 p.m.
31-35 Church Avenue, between Story and Chester Ave.
West Kensington Community Action Group is a group of concerned citizens that live in (or the vicinity of) the area just below Greenwood Cemetery in Brooklyn, NY. Our mission is to unite as a community and address issues together to improve our neighborhood.Many of us have voiced complaints to 311, the Dept of Sanitation, and Greiner-Maltz (broker of lot) for years about the filthy lot at 31-35 Church Avenue to no avail. We are now ready to take matters into our own hands and invite you to come partake in the fun!On Saturday, September 27th from 11 a.m. until 3 p.m. we will be making a beautiful mural, "Kensington Gardens", to hang on the front of the locked lot and hopefully grab some attention from the media. Our ultimate goal is to get that lot cleaned up. It is time for us to take back our community and not let the absentee owners allow the RATS and GARBAGE to continue to multiply. ENOUGH IS ENOUGH! Please bring all of your family, friends, and neighbors by and paint a flower or two. It will be a great way to get to know some neighbors, do something good for your community, and have fun!!! Refreshments and paint provided!!!!! CB 12 (Kensington) meetings are held most often at the AMICO center (5901 13th ave, 3rd floor) which is across the street from the CB office. The entrance is on 59th street. For first-time buyers, the trade-off between convenience and environmentoften leads to longer commutes but quieter home living. Julie Seltzer, a33-year-old transportation planner, and her husband bought a house inKensington in 2004. Ms. Seltzer travels 45 minutes to and from midtownManhattan every day. After renting a house with her husband in Bensonhurst for four years, Ms.Seltzer knew she wanted to buy a home in a similarly quiet Brooklynneighborhood. She and her husband live in a three-bedroom postwar co-op, and it tookthem two years and countless trips to Bay Ridge, Fort Greene and CarrollGardens to find it. They paid $313,000 for their apartment back in 2004,and similar units in the neighborhood are now on the market for over$500,000. The Oak & The Iris, on Ft. Hamilton & E. 4th is now open on Saturdays! They're also starting with a limited weekend dinner menu. We hear there are four pre-fixe dinners (beef, chicken, pasta,and fish) plus their thypical salads. Dinner hours are from 6-10pm although we're not sure if this includes Sat. Just an FYI... There is children's play corner that and free Wi-Fi is in the works. How about we stop focusing on what is not here in Kensington, for a moment. The best Chinese place in Kensington/or maybe even best on Church? Best "other ethnic" i.e. Faros, Falafel Fusion...? Which is better Denny's or Shenanigan's? Triangle-Below-Greenwood (Tri-Be-Green) had its very first meeting yesterday. We are a group of concerned citizens that live in (or the vicinity of) the area just below Greenwood Cemetery. Our mission is to unite as a community and address issues together to improve our neighborhood. As you know, many of us have voiced complaints to 311, the Dept of Sanitation, and Greiner-Maltz for years about the filthy lot at 31-35 CHurch Avenue to no avail. We are now ready to take matters into our own hands and invite you to come partake in the fun! On Saturday, September 27th from 11 a.m. until 3 p.m.we will be making a beautiful mural, "Kensington Gardens", to hang on the front of the lot and hopefully grab some attention from the media. Our ultimate goal is to get that lot cleaned up. It is time for us to take back our community and not let the owners allow the RATS and GARBAGE to continue to multiply. ENOUGH IS ENOUGH! Please bring all of your family, friends, and neighbors by and paint a flower or two. It will be a great way to get to know some neighbors, do something good for your community, and have fun!!! Refreshments and paint provided!!!!! When: Saturday, September 27th, 11-3 p.m.
What are the reviews of our new cafe? Sometimes, the smaller the place, the bigger the menu. Such is the case at Am-Thai, where the elephantine bill of fare extends to 130 dishes in 11 categories—and that's not counting the options multiplier, by which any dish can be made with shrimp, fried tofu, chicken, beef, whole or filleted fish, duck, or even mock duck, making over 1,000 choices in all. Michael from Playground of Sound is hosting a music class in Greenwood Playground on Sat. at 10.15. We heard from 2 emails that the Oak & Iris will be opening this weekend or early next week depending on the inspection. We've walked by a few times and seen a fancy cappuccino machine and lots of tables as well as a vibrate paint job. We are excited to see the selection and stop in! corner of E4th St. & Ft. Hamilton Ave.
A two-headed turtle was kidnapped from the Hamilton Dog House, an animal shelter and pet supply store on East Third Street in Brooklyn. Sean is saddened by the whole situation and is willing to take the turtle back no questions asked. There is a $1000 reward being offered for the safe return of the turtle. Neighbors started putting up flyers around the neighborhood but someone has been malignant enough to rip them down just as fast. We've heard some rumblings about locals getting their bikes stolen. We know of one on East 5th, another on Ocean Pkwy and got an email today about a bike stolen in front of Kensington Library. Anyone else have a bike stolen recently? Limited to 10 kids (with caregiver) per session. Angie, owner of Thai Tony's, has invited everyone to come in and try the new place MAKI SUSHI! Angie reminds us that not all Sushi is raw so there's something for everyone!!! Jacob Stevens from Council member Bill de Blasio's office is coordinating Graffiti Surveying Tuesday, August 12th at 5:30pm. Any volunteers, please meet at the corner of Church Avenue and Coney Island in front of Rocky's Pizza. A bunch of you emailed us to post the note on the door of the old Jimmy's, soon to be the new "The Oak and The Iris Cafe." Soon (August) we will be opening a beautiful healthy cafe with full coffee/tea/juice bar, breakfast and brunch; sit down for delicious meal and your essential groceries all in one. The Oak and The Iris Cafe, here to serve our community. Join Studio-in-a-school art educator, Michelle Hinebrook for art programming at Greenwood Playground. Children will learn about the environment and sustainability using paint, clay, collage and otherart materials. First session begins at 10:00 and will be geared for4-6 year olds. The afternoon session will be appropriate for tweens and younger. Sign up at the park will be necessary because each class will be limited to 20 kids. Note: this is NOT a drop-off class. MTA elevator installation: Installation of the MTA elevator on McDonald Avenue near Church Avenue is expected to be completed by the end of June. 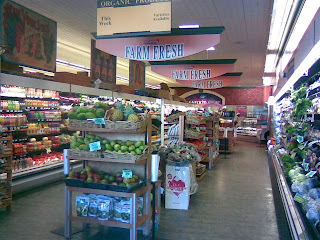 Foodtown renovation: The renovation of Foodtown is expected to be completed by the end of July. Kensington Post Office aggravation: The Kensington Post Office (KPO) has a new manager and a new delivery supervisor. According to the KPO, a lobby director is required to be on duty in the lobby from 10 a.m. to 2 p.m. to direct people to the post office’s various resources, such as the stamp machine and the passport line, and answer customers’ questions about which forms to use and how to fill them out. If you are in the KPO between 10 a.m. and 2 p.m. and do not see a lobby director on duty, report it to 1-800-ASK-USPS. Report complaints, such as misdelivered mail, to 1-800-ASK-USPS. The name and phone number of the KPO manager are supposed to be on view inside of the post office. Based on the amount of credit card usage by customers, the KPO is not eligible for a self-service kiosk. However, an attendee at the ANA meeting stated that credit card usage is low because the credit card machines are broken. KPO is eligible for scales for use by customers, foreign language posters, and passport fairs. A Contract Postal Unit (CPU) will open in Kensington (a CPU is a privately-run kiosk that is inside of an existing retail store and has a person in attendance) if a retailer can be found who has an appropriate space and is willing to house the CPU. The Brooklyn Post Office participates in the USPS’s Mystery Shopper project (http://www.usps.com/strategicplanning/stp2007/improve_002.htm). The manager of the KPO has been invited to participate at the next ANA meeting. Assemblymember Jim Brennan pointed out that zip code 11215 (Park Slope) has three post offices, but Kensington only has one. He said that Congress would have to designate money for an additional post office for us and suggested that Yvette Clarke, our representative in the House of Representatives, be invited to the September meeting. Traffic congestion: An ANA member reported on a Department of Transportation (DOT) meeting about street traffic congestion on Church Avenue between McDonald Avenue and Utica Avenue caused by double parked cars, cars making illegal U-turns, bicyclists, and the lack of ten-second pedestrian phasing (which turns the WALK light on ten seconds before the green light goes on) and on sidewalk congestion caused by merchandise placed in front of stores. On Thursday, June 19th, DOT will conduct a walk-through of Church Avenue to learn about specific problems. We are invited to meet up with the DOT representatives at Church Avenue and Coney Island Avenue at 5:15, walk with them to McDonald Avenue, and point out the problems as we see them. Express bus service elimination: The MTA’s Vice President of Planning and Operations unsuccessfully attempted to justify to the large number of aggrieved commuters the elimination of the BM1 and BM2 express bus stops in Kensington. The major issues mentioned by the Kensington commuters are: 1) During the day, there is often a forty-five minute wait between buses because the staggering is “off.” This is detrimental to the community because the bus functions as a viable transportation alternative for the elderly and the sick. 2) Kensington commuters often see BM1 and BM2 buses that are only half-filled drive past them as they wait for the very full BM3 and BM4 buses to stop for them. As a result, some Kensingtonians have to stand up on these BM3 and BM4 buses (the MTA VP told us that that does not happen). It is clear that resources need to be allocated better. The VP told us that Command Bus left a mess that the MTA has been cleaning up. We in Kensington are defined as part of that mess: When an express bus stops to pick us up, we make the commute longer for passengers who boarded at the beginning of the route. He promised that larger buses will be assigned to the BM3 and BM4 lines. He said that if those get overcrowded, the MTA will think about restoring some of our BM1 and BM2 service. 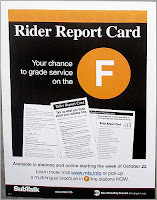 If the MTA does change the schedule, it will not go into effect until September. The VP will report back to the ANA president in two to three weeks. ANA committees and changes: Over the summer, the ANA will establish a committee to draft changes to the by-laws in order to address boundary issues for members, membership and membership dues, and streamline the officer core. Once complete and in effect, the ANA will nominate officers for the new positions and hold elections. Next meeting: The next full meeting of ANA will be in September, date to be announced. Please sign the petition below in support of off-leash hours from 5pm to 9pm in the Nethermead within Prospect Park. We urge a return to off-leash hours in Prospect Park's Neathermead from 5pm to 9pm, Monday through Fiday, excluding holidays. This long-standing privilege was lost during last year's change in the NYC Off-Leash Law.